Where do I use my Gaia Skincare voucher code? Each and every ingredient inside Gai Skincare products have been chosen for its beneficial properties not just for the body but the mind too. Gaia believes that all their products can not only make your skin feel a certain way but how this can resonate into your body & mind! Created using natural and organic ingredients, you can guarantee that everything a Gaia is natural and has not been tested on animals. From Lemongrass and lavender to frankincense, Jojoba, Ravensara, Geranium and so much more, each and every ingredient is made with Gaia’s awakening, balancing and calming blends. You can also rest assured when shopping at Gaia that their products do not contain parabens, sulphates, synthetic colours or fragrances and their packaging is 100% recyclable - it’s this that really set Gaia apart from their competitors. Shop the wide abundance of renowned products now online and don’t hesitate to add one of our money-saving deals to your order to help reduce your online spending and get more of what you love for less. Shop the abundance of simple, effective and beautiful products in the Gaia Body collection where everything is designed to awaken, calm and balance your skin and body in the most natural way possible. From Body Oil & Body Wash to Lotions, Scrubs and Body Butter - shop the unique collection and experience skincare like no other. Update your regime and begin to feel like a new version of yourself with Gaia for less when shopping online using one of our Discount Codes which you can find right here on our deals page. Set on the grounds of Devon at the A Grade I listed 16th-century country manor house hotel called Boringdon Hall is the Gaia Spa. Boasting 12 treatment rooms, a 14m pool and hydrotherapy pool, 5 heat experiences, state of the art gym, a deep relaxation room and a patisserie restaurant, Gaia Spa is a special place built to the highest standards. Gaia specialises in offering management consultancy services to help other businesses create the perfect spa environment so you can often find Gaia products in Spas across the country. Delivery is Free on all items within the UK. If you wish to make a return, you must so within 14 days of the original delivery date. Items must be unopened and in their original packaging before a refund or exchange can be issued. Check out the Returns & Refund page for more details. 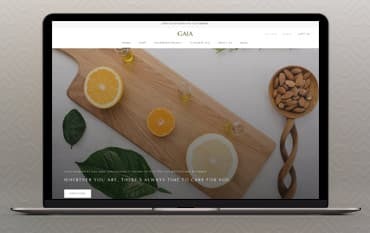 What sets Gaia Skincare apart from other skincare retailers on the market is that everything created at Gaia is handmade by people and not machines. All Gais products are natural and have been carefully blended to help dissolve the visibility of stress and awaken, balance & calm the skin! Shop everything from Bath salts and oils, body lotions and scrubs, face, hair products and so much more for less when using one of our Gaia Skincare Voucher Codes which could help you save money off your next order.